Ever heard of Dexter Romweber? Me either...until I saw this film. I had heard of The Flat Duo Jets (but had never heard of any of their music) and oddly enough I knew of Dexter's sister Sara who used to play in the band Let's Active. Being the huge fan of rock documentaries I figured I'd give this one a shot. This disc was released last year by MVD. Dexter Romweber began playing music at a young age and started Flat Duo Jets (named after a guitar) as a duo with a drummer simply named Crow. The band gained popularity in the local Athens indie music scene that spawned R.E.M., The B-52's and many other notable college rock staples (for more info on these bands, check out the brilliant 80's documentary Athens Inside/Out). Dexter proved to be a gifted musician but unfortunately he had problems with substance abuse and mental illness which doomed the band's longevity. 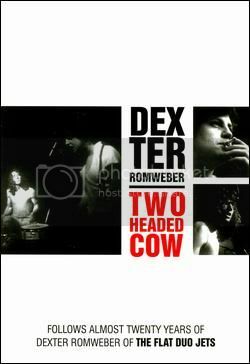 Two Headed Cow succeeds in showing the two sides of Romweber. You can't help but feel sorry for the guy, though some of the misfortunes were self induced. What can't be disputed is the musical brilliance this man possesses. This documentary was actually started many years ago and just recently finished so it has a great mix of old footage and new footage showing Dexter still playing his heart out in front of adoring fans. Overall this film is a perfect mix of great music and a tragic story of one man's journey trying to conquer demons and by doing so, touching a lot of fans. The DVD includes interviews with Jack White, Neko Case, Mojo Nixon, Exene Cervenka and more.